I started off searching for a British made combination padlock, but there are very few UK made combination padlocks available. British made key padlocks are available, although they can be hard to find. According to some people keyed padlocks are more secure and the numerals on the thumbwheels of combination locks tend to become difficult to read over time, as general wear (or just weathering) cause them to deteriorate. This makes these padlocks particularly ill suited to use in poor light conditions or in outdoor locations. I read somewhere that a combination lock code with three numbers can typically be cracked in roughly 40 minutes and that while a key padlock can be picked, they are considered more secure than their combination counterparts. A padlock becomes more secure if the shackle can be further protected from saw or bolt cutters by being enclosed. Of course with a keyed padlock you have to carry the keys around and you might lose the key or someone might copy it. Most padlocks can be cut with tools like bolt croppers and angle grinders. Most suitcase type smaller padlocks are not very secure. Most if not all locks can be picked. With combination locks I have found it is possible to accidentally alter the combination without noticing and end up not knowing what the combination is and these locks are quite easy to pick, so I have moved to a keyed lock in most situations including on my suitcase. 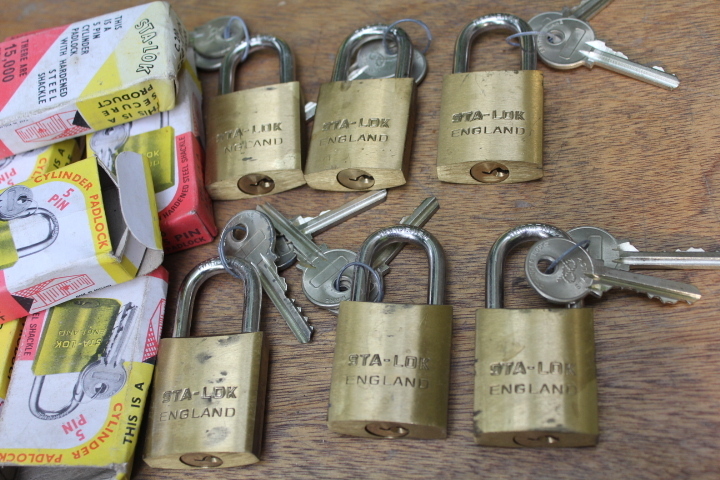 These are the British made padlocks I have found so far. Do you know of any more? 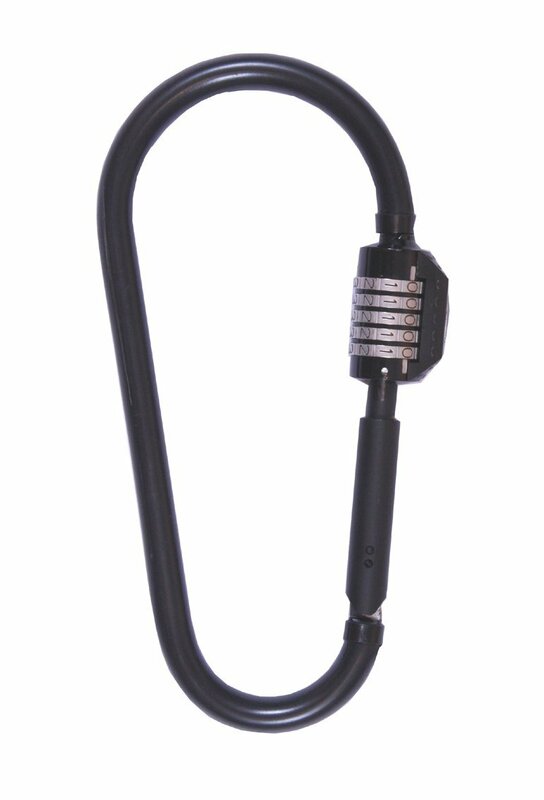 Reece Safety Products Ltd – http://www.reecesafety.co.uk/Padlocks.htm – All their brass key padlocks are British made. Various keying options – differently keyed padlocks, padlocks keyed alike (same key fits many padlocks) and differently keyed plus a master key. Serial numbered. Various body sizes and shackle lengths. Wholesale or individual orders on their website. Prices on their website exclude VAT and delivery. Please note their combination padlocks are not made in the UK. B & G Lock and Tool Co. Ltd – http://www.bgpadlocks.co.uk – Founded in 1945, the range of brass padlocks shown in their website is entirely British made at the Chapel Green works under the trade names STA-LOK, STA-SECURE and B & G. The company is now owned by Guardian Lock & Engineering Co. Ltd. Various keying options – differently keyed padlocks, padlocks keyed alike (same key fits many padlocks) and differently keyed plus a master key. Serial numbered. Various body sizes and shackle lengths. Custom padlocks, colour coding, chains and engraving available. Please note their combination padlocks are not made in the UK. 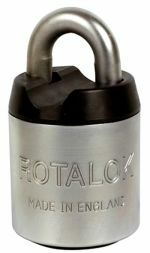 STA-LOK padlocks. Made in England. B & G 3/4″ Extruded small Brass Padlock (A100 BS). Warded Padlock. Made in England. Guardian Lock & Engineering Co. Ltd. – http://www.imperiallocks.co.uk – Founded in 1982, they operate from the Imperial Works (built for Imperial Locks in the early part of the twentieth century) – Trade only – Mortice locks, latches, rim cylinder latches, various keyed padlocks, traditional padlocks, escutcheon plates, keys and other complementary products made in the UK and marketed under trade name IMPERIAL. Squire Snaplok Combination Lock – Black, 26 cm. Made in Britain. 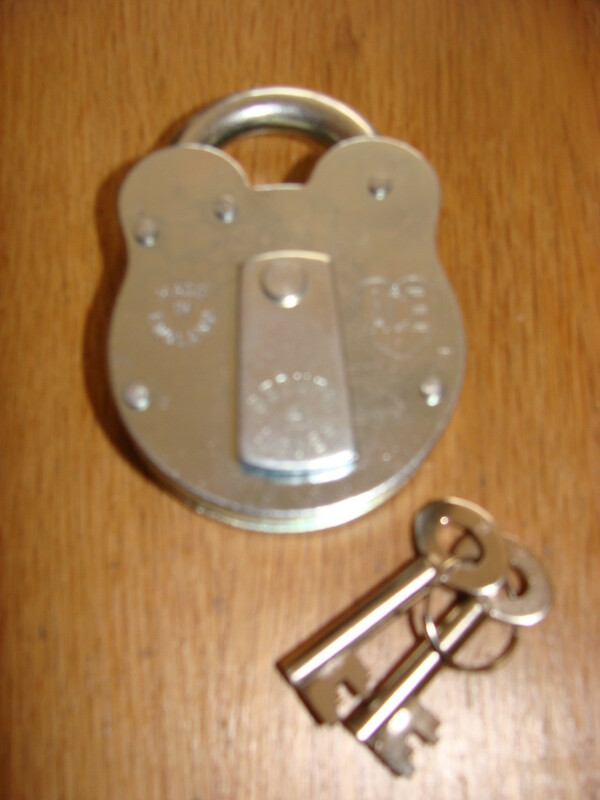 A Rotalok Open Shackle Padlock, clearly marked ‘Made in England’. Sterling (Sterling Locks Ltd.) padlocks and other products are made in China. Tri-Circle padlocks are made in China. Master Lock are an American company and some of their products are partially made in the USA. Abus is a German company and their padlocks and other products are made in Germany or China. Chubb according to their website no longer make locks or safes. Chubb safes are made by another company called Chubb Safes (who belong to Swedish company Gunnebo). It does not say on their website that they still have a factory in the UK, so I suspect not. According to the internet Chubb Safes are now made in Sweden and Indonesia. Chubb locks is now a brand name of Mul-T-Lock, a subsidiary of the Assa Abloy Group and the Chubb name is no longer used on their domestic locks. I am not sure if Mul-T-Lok products are made in the UK, so please check before buying. Assa Abloy also own Ingersoll Security and again you should check if their products are UK made. Chubb Locks Custodial Services Ltd continues as a trading division of ASSA ABLOY Limited. They continue UK manufacture of custodial locks and handcuffs for secure establishments, but if you are a buyer for such products you should check if you what you need is UK made. These changes to Chubb apparently came about due to the expiry of the licence granted by the American multi-national company who actually own the Chubb name. Assa Abloy also trade under the Abloy name, selling door locks, but their website does not mention manufacturing in the UK. Assa Abloy are a Swedish company. Yale and Union (Josiah Parkes) are also part of the Assa Abloy Group. The Yale & Union production facility is still operational in Willenhall. Some heavy duty Yale padlocks are still made in the Midlands, as are some of their other products. You’ll have to ask which of their products are UK made, as country of origin is not shown on their website. Yale do not make any of their travel padlocks in the UK. Union High Security padlocks and their brass cylinder padlocks are made in the UK, but you will need to check whether their other padlocks and other products are still made in the UK. 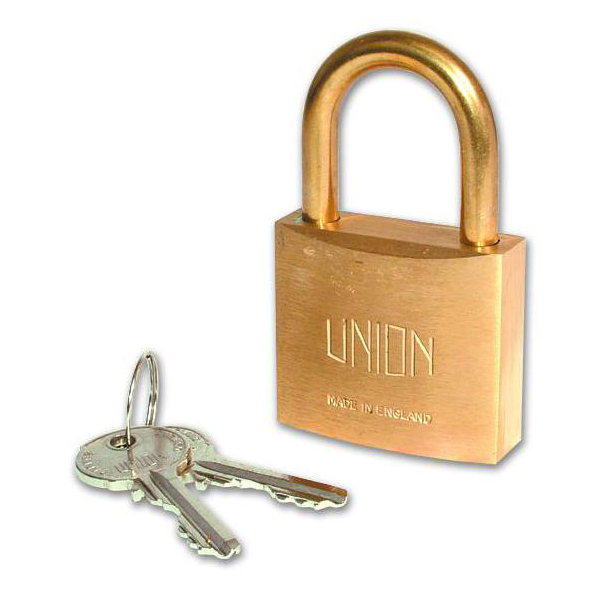 Union 3102 Brass Body Padlock. Made in England. For more gun safes please click here. Phoenix safes are a “proper” old English brand who describe themselves as “A UK Manufacturer” & make use of the Union Flag on their site. In May 2017 they informed Rob (one of my contributors) that they no longer produce ANYTHING in the UK. 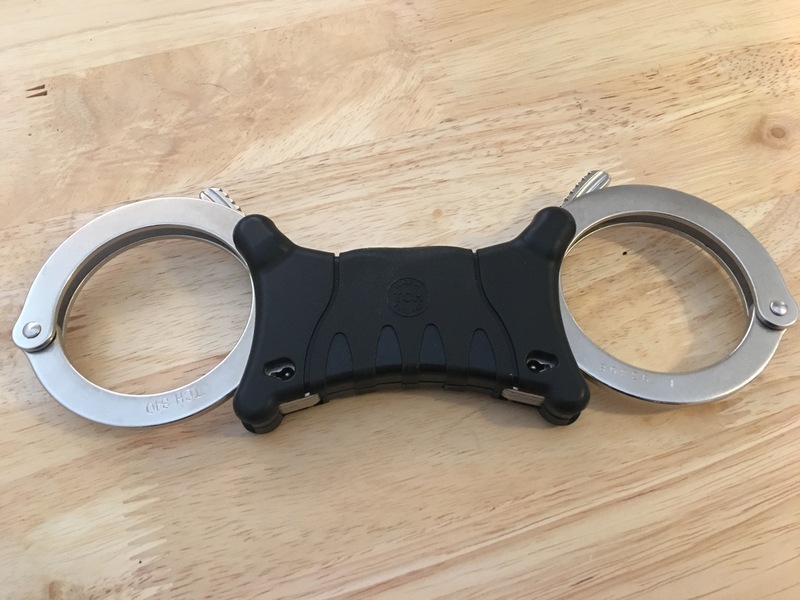 TCH rigid handcuffs. Made in England. Photograph by author. 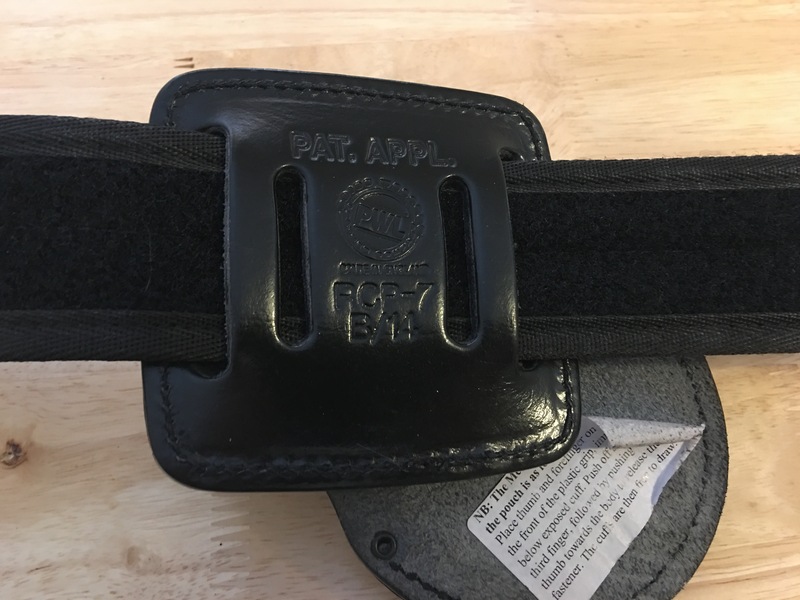 PWL RCP-7 B/14 right-handed leather handcuff holster. Made in England. Front view. Photograph by author. 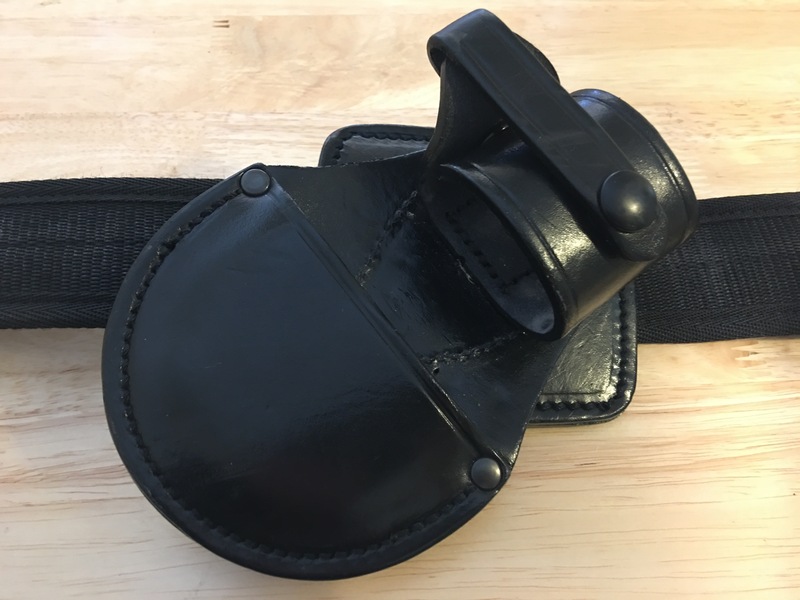 PWL RCP-7 B/14 right-handed leather handcuff holster. Made in England. Rear label view. Photograph by author. Erebus (door locks) and Legge (locks and latches) and Briton (door locks) are now part of the Irish company Ingersoll Rand and there is no mention of UK production on their website. So, whilst I assume they are foreign made you should check with Ingersoll Rand if you are interested in their products. 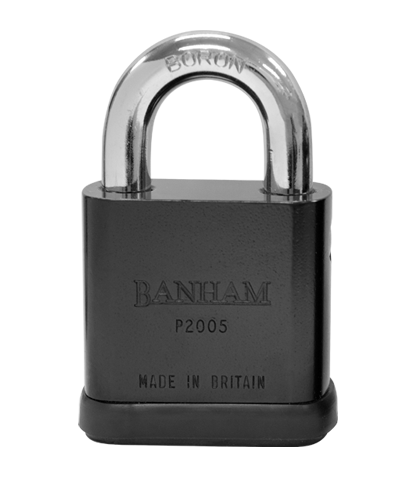 Banham Patent Locks Ltd. – http://www.banham.co.uk/locks/padlocks/ – their exclusive keyed padlocks are made in the UK. I am not sure about their other products, so please check before buying. P2005 Banham Open-shackled Padlock. Made in Britain. 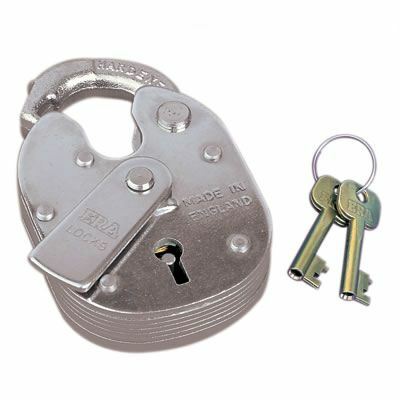 ERA Closed Shackle Padlock – 64mm. Made in England. 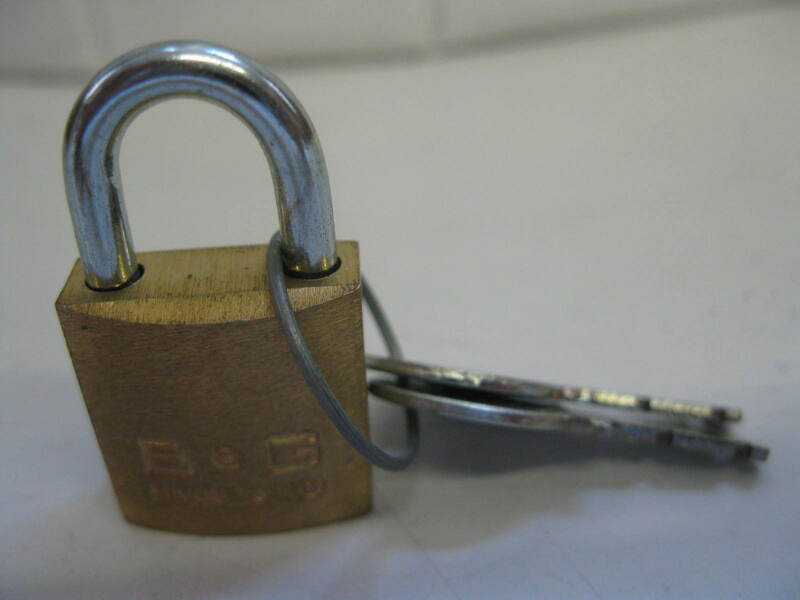 Pro-Lock – http://www.pro-lock.co.uk – brass padlocks are made in the UK. Various keying options – differently keyed padlocks, padlocks keyed alike (same key fits many padlocks) and differently keyed plus a master key. Serial numbered. Various body sizes and shackle lengths. Not sure of the country of origin of their other products. No combination locks. Quality Lock Co. – http://www.qualitylocks.co.uk – rim locks, mortice locks, night latches, gate locks, brass ships locks, galley locks and furniture locks, fire escape locks, cell locks and hospital locks; plus repairs. Not padlocks. They are also the sole manufacturers of old James Gibbons Range of locks and keys. Please check before buying that what you want is made in the UK. The Quality Lock Company is a subsidiary of Kirkpatrick Limited. John Worrall and Sons – http://www.jworrall-locks.co.uk – Locks, keys and associated hardware, mortice locks, sash locks, cabinet locks, traditionally styled padlocks. All made in England as far as I can tell, but do check before purchase. Walsall Locks Ltd. (ACE Locks; Zeni Locks) – http://www.walsall-locks.co.uk – manufacturers a traditional range of locks, assembles locks in the UK from imported components and sells imported products – mortice locks, safe locks, padlocks, cabinet locks, etc. You will need to ask if the product you are interested in is made / assembled in the UK. They have made in England keyed padlocks – close shackle and old English, armoured bodied and basic brass – confirmed by the company as all manufactured in the UK. Walsall padlocks are available (trade only) at SKS Ltd. and on the internet and in shops. Ace Old English 4 Lever Steel Padlock Made In England. 1st Access Self Storage in Peterborough say they sell a combination lock that is hand made in the UK. I have not seen this product though. 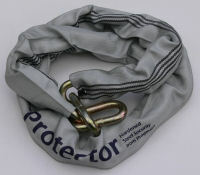 Pragmasis Protector 11mm Security Chain. Finished in the UK. http://www.link51.com – Link51 are based in Telford and are the biggest UK manufacturer of lockers and also make Shelving and Pallet Racking. They buy some UK made locks and others from European or Chinese sources. http://www.premierlimited.co.uk – lockers, cycle shelters, bus shelters, smoking shelters, etc. http://www.zedlock.com – make farm gate locks in the UK. This entry was posted in Lockers, Padlocks and Locks and tagged Abbey Foundry, ACE Locks, Almax, Asgard, B & G, B and G Lock and Tool Co. Ltd., Banham Patent Locks Ltd., Bison, Bramah, British Made Padlocks, British Padlock, British Padlocks, Bulldog, Bulldog Secuew, Combination Padlocks, Davenport-Burgess, English Padlock, English Padlocks, Epic Safes, ERA, Guardian Lock and Engineering Co. Ltd., Henry Squire and Sons Ltd., Heritage Leather Goods, Imperial, Imperial Locks, John Worrall and Sons, Josiah Parkes, Kirkpatrick Limited, Klick Fast, Klickfast, Link51, Liston Locks, Lockers, Locks, Padlock, Padlocks, Padlocks and Locks, Padlocks Made in England, Padlocks made in the UK, Peter Jones (ILG), Peter Jones (ILG) Ltd, Pragmasis, Premier Lockers, Price Western, Pro-Lock, Probe Lockers, Quality Lock Co., Reece, Robinson Mesh Products, Rotalok, SMP Security Solutions, Squire, STA-LOK, STA-SECURE, Staylock, TCH, TCH Batons, TCH Handcuffs, Tklamp, Total Control Handcuffs, UK Made Padlocks, Union, Walsall Locks Ltd., Yale, Zedlocks, Zeni Locks on July 26, 2013 by ukmade. This entry was posted in DIY Tools, DIY, Building Work, Household products, Ironmongery, Kirkpatrick, Procast Foundry and tagged Aarrow Stoves, Abbey Foundry, Anglian Windows, Arada Stoves, Bartington Forge, Be Modern, bio-bean, Bison Frames, Black iron door furniture, Black iron window furniture, Blacksmiths, British Ironmongery, Certainly Wood, Chimney Sheep, Coachbuilders, Door Furniture, Doors, duRose Ltd, Evolution, Fireplace Accessories, Fireplaces, Flamers, Gazco, H Goodwin (Castings) Limited, Ironmongery, IronmongeryOnline, John Fredericks, Kirkpatrick, Loft Leg Ltd, Made by the Forge, Melissa Cole, Midland Holloware, Mike Rowland & Son, Paradean, Pennine Castings Ltd, Performance Doorset Solutions (PDS), Procast Foundry, Real fires, Rockingham Fenderseats, Stovax, Stratford Stoves, The Blacksmiths Shop, The Cast Iron Air Brick Company, The Door Knocker Company, The Safety Letterbox Company, The Woodee, Turnstyle Designs, Villager Stoves, Wheelwrights, Window Furniture, Windows, Windy Smithy, With Love Project, Yeoman, Yesterhome on July 19, 2013 by ukmade.